At Sappi, we believe that the key to profitable, sustainable development is customer focused innovation in both our products and our processes. Globally, over 25 percent of our R&D spend is dedicated to our 'Exciter' program, which focuses on the development of breakthrough technology platforms. The bulk of R&D spend in the United States of America is dedicated to product development and innovation efforts. The Technology Center in Westbrook (Maine), is the center of our R&D operations in North America. It houses approximately 50 technicians, engineers and scientists whose goals are to discover and implement new products, optimize current product quality and improve product cost in support of not only Sappi North America operations, but global initiatives as well. Scientists at the Technology Center bring a diverse set of skills and a unique depth of knowledge to their work. Chemists, engineers and physicists work alongside polymer, environmental and materials scientists to support the release papers, packaging and coated papers business units. Past and present employees of the Technology Center are the proud inventors of over 250 patents that have helped Sappi and the customers we serve maintain a competitive edge for years. Current R&D work is exploring ways to leverage the entire tree for new and improved bioderived materials. Some portions of the tree, if processed correctly, are pound-for-pound stronger than steel, and can be used for many applications like high strength composites, adhesives and the production of biobased chemicals. Our research and development units operate in three distinct geographies with varying areas of expertise. Sappi Europe focuses on fiber characterization, wet end chemistry, multilayer coating and operational excellence. 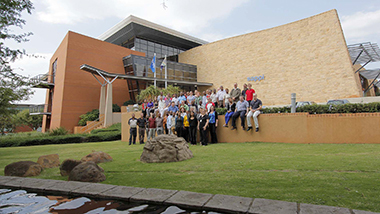 Sappi Southern Africa concentrates on forestry, land management, pulping technology (including kraft, viscose and acetate) and fiber processing. Sappi North America drives innovation in coating chemistry, filler technology, ink and paper interaction, unique finishing and radiation curing. Together we form a global network able to bring the new and different to our customers with speed.